Joint-boss Shaun Sparrow is hoping his Rothwell Corinthians can make a bit of history this weekend. Corinthians have made a fine start to the new ChromaSport & Trophies United Counties League Premier Division campaign with two wins out of two as they followed up a 2-1 home success over Harborough Town with a victory at Peterborough Northern Star by the same scoreline last weekend. They take on Huntingdon Town at Sergeants Lawn tomorrow (Saturday) with Sparrow and fellow joint-manager Jim Scott eyeing up the best start to a season in the club’s history. And Sparrow is keen for his team to continue to put points on the board while they have the chance. “It was a tricky pre-season in terms of people being away and injuries we picked up but we always felt it was a bit better than the results suggested,” Sparrow said. “But once the season started there was a reaction from the players. “We weren’t at our best last weekend but when you win two games on the bounce in this division you have to be happy. “It would be remiss to say you should beat anybody in this league but it would just be great for us if we could keep it going. “I would love to be talking after the game with nine points from nine and the players should be challenging themselves to see how long they can keep going for. “I know Huntingdon struggled last season and I know they are stronger this time. “They’ve already won a game so that proves the point. “If we work hard and perform well, we know we are capable. “And if we can win then I think it will be the best start to a season in the club’s history so it would be great to set that mark. 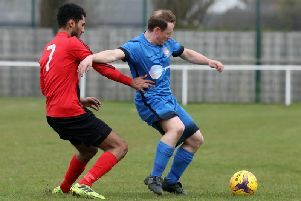 Jon Mitchell has urged his Wellingborough Town players to produce a reaction when they head to Oadby Town this weekend. The Doughboys’ UCL Premier Division campaign started in impressive fashion as they beat Eynesbury Rovers 4-2 at the Dog & Duck. But they suffered their first defeat of the season last weekend as, despite Deven Ellwood giving the hosts the lead, Sleaford Town fought back to win 3-1. It left boss Mitchell frustrated after such a good performance just a few days earlier. Now he is looking for his team to show some consistency as they get ready to take on an Oadby side who, like Wellingborough, have started the season with a win and a defeat from their two league matches so far. “It was a total disappointment after the great result we had against Eynesbury,” Mitchell said as he reflected on the defeat to Sleaford. “I thought we would kick on after starting the season so well and we felt we had an opportunity against Sleaford. “But they relied on one ball in behind our back four all afternoon and we looked really panicky in defence. “We took the lead and we had other chances that we missed but defensively we were shaky and it was 10 minutes of madness that cost us. “We need a bit of consistency and it’s frustrating because we thought we had it after the Eynesbury game. “Stuart (assistant-manager Goosey) and I will go through it all in training and pick a side for Oadby but the lads will have to give us a reaction.